Frangible 38 special ammunition is designed to prevent over penetration when the round strikes a hard target. These rounds break apart at impact and splits into several different pieces when it strikes a target. Frangible ammunition can be used when shooting steel targets for safety purposes ---- since the rounds breaks apart, there is reduced danger of ricochets. Frangible Ammo is the preferred round for shooting at steel targets at near ranges. Safer than lead for this purpose. 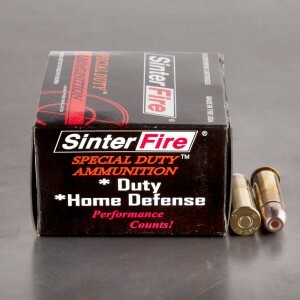 Total lead free bullet and primer safer with revolver. All rounds fired reliably.